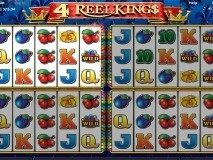 The 4 reel Kings as the name implies, is a four reel slot game. It is provided by one of the best casino software providers, Greentube. With their former games, no doubt they have fed the online casinos with unending game experience that have always been widely accepted by players worldwide. Their games are always fun and exciting to any player whether experienced or a novice. Needless to say, the 4 Reel Kings is of course no different. It is an exciting game with very high chances of winning with no experience required to secure you lots of cash winnings. The 4 reel kings game gives you 4 chances of winning. It has a total of 20 reels as compared to most slot games that contain 5 reels, and it is for this reason that you even stand a higher chance of winning if you participated in playing this game. These reels are spread across four machines increasing your chances of landing a win exponentially. With the 20 playlines found in the game, you could cash in huge if the symbols land in the required order on any activated playline. If by any chance the moneybags appear on all the lines you could consider yourself a big time winner since you will receive massive prizes and cash. There are mini-slots that appear randomly as you play this game and they also increase your chances of winning even more prizes and bonuses as well. For you to start playing however, you will need to place a bet so as to activate the lines you will bet on. Select the twist amount you would like to bet per game and this could easily be adjusted by pressing the + or - signs. You can then decide how much you will bet per line and then run individual spins by pressing start or press autostart to run the spins automatically. If you click the stop button, you will stop the auto spins. You can use the playtable button to see your winnings and also calculate your possibilities of a win. There is the Reel-King feature where you stand a chance to clean up and win huge with the 4 reel Kings game. After a spin, up to 5 reel kings can randomly appear, or they can appear when all the letters of the word ‘4 reel’ light up in the slot machine title. They act like slot machines with three reels and 4 symbols. You will then start the reel king feature with the Start or Autostart button. You could win various prizes depending on the 7 symbols and their colors. If a combination with a diamond appears the reel king will end. You could use this feature as long as it is not eliminated by the diamond symbols. There is also the exciting and breath taking gamble feature. It is one of the most captivating feature of the 4 reel king game. For the more daring and courageous players, here is your chance to prove your might and see how your risk could make or break you! After you make a win by spinning the reels, you are offered a chance of either banking your winnings to your account or risking them in a gamble game where you get double or nothing. It is a risky endeavor which is only activated by your own will. This means you have the choice to opt out and save your winnings or risk them all and get double if you are lucky or lose them all if you are unfortunate. The gamble button will appear anytime a win is made and if you press the gamble button, you will start the gamble game. Your odds here are always 50:50 and no one can claim to have a better hand; it is either you win or you lose. However, if you don’t want to risk your winnings, press the bank button and your winnings will be added to your account.